After the revolutionary redesign of the top-selling vehicle in US, the Ford F-150, the Blue oval brand will implement the similar strategy for its super-duty series. The product of this redesign as Ford likes to say will be the most capable, smartest and toughest super-duty models ever. The 2017 Ford F-350 Super Duty is one-tone full-size model in this series and it will also bring improvements and upgrades on all fronts. The Ford has redesigned models with Implementation of modern lightweight materials and more high-strength steel will be used for the frame construction while the body panels will be made from the aluminum. Adding to its tougher structure the new Super duty models will also benefit from more potent engines which also means higher payload and towing capacities. Ford will also add attention to new and upgraded equipment and focus will also be on smart and secure loading as well as on the safety. The model will come back in three cab styles and five trims including XL, XLT, Lariat, King Ranch and Platinum. Under the hood department, however, will not go with radical downsizing and turbocharging as the F-150 did. There will sit the same engine options but they are expected to produce more power and torque. Unfortunately, Ford hasn’t defined new engine specification and towing abilities but a standard 6.2 liter V-8 gasoline engine will probably exceed the current ratings of 385 hp and 405 pound-feet of torque. This engine can also run on CNG when conversion kit is used. It will come paired with new six-speed automatic transmission. 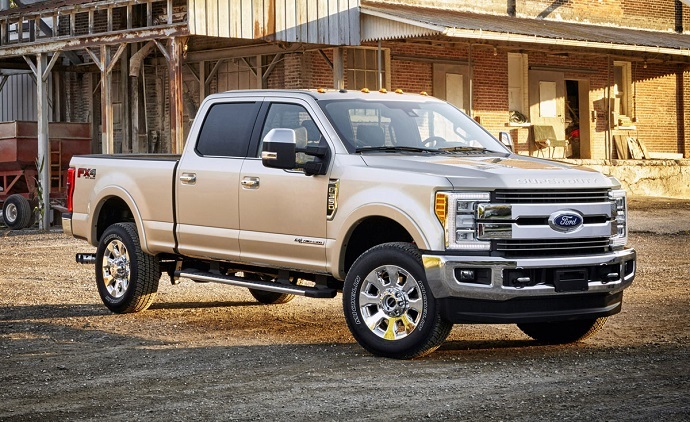 More power and torque will be available with recently upgraded 6.7 liter Power Stroke V-8 turbodiesel which will be option on all versions and will be matched with a six-speed automatic gearbox. The current version can produce 440 hp and torque reaches 860 lb-ft. The standard on all models will be rear-wheel drive while optional all-wheel drive comes with two-speed transfer case and rear locking differential. Configuration with single rear wheel (SRW) as well as dual-rear wheel (DRW) formation will also be available. As we said earlier, the Ford hasn’t revealed official towing ratings for new generation model. However, with V-8 gasoline we should expect around 12, 500 pounds in case of configuration with single-rear wheel and standard hitch or more than 16, 000 pounds will be allowed with DRW. When trailer is with fifth-wheel or gooseneck, gasoline V-8 with SRW will allow 15,900 pounds or 16,100 pounds with DRW. In case of diesel powered model standard hitch will allow 14, 000 pounds with SRW and 19, 000 with DRW. Configuration with diesel engine, SRW and trailer with fifth wheel mount will be rated up to 16, 500 pounds while DRW at 26, 500 pounds. The 2017 Ford F-350 Super Duty will also sport fortified suspension components, drivelines, axles and upgraded towing equipment which are designed for heavy-duty strains. Improved power-steering system will also be assisted by a small electric motor which makes steering easer when the truck is at low speeds and under large loads. The style and interiors will also experience some changes and as it was mentioned more substantial upgrades will be done on truck’s underbody construction and sheetmetal. The new 2017 Ford F-350 Super Duty will be planted on the fully-boxed frame which includes up to ten crossmembers and its structure now comprises more than 95 percent high-tensile steel. With this structure, Ford claims that new frame is 24 times stiffer than one on the current version. New model will also have aluminum based body panels which helps it to slash some weight which in total with frame weight savings is around 350 pounds. On the other hand some styling changes will also be showcased on the new models and it will gain new quad-beam headlights and restyled grille. The grille now includes two horizontal slats with Ford badge in the middle. Model will also showcase new taillights and in higher trims they are also equipped with LED technology. All versions will also feature longer cabins and interior will be upgraded as well. Thanks to the longer cabins more space will be opened for more leg room while Super Cab and Crew Cab versions will have flat load floors in the rear seating row. Also available will be the latest Ford’s infotainment system and focus will also be on the safety where systems like forward collision mitigation, lane departure warning, blind-spot system and adaptive cruise control will be added. The seven-camera system which will provide all-around view, cargo box view and on trailer mounted camera will also be available. The new F-350 will be available in five trims and three cab configurations. Regular Cab models are with two doors and room for 3 passengers. Four-door Super Cabs has rear-hinged doors while four full-size conventionally hinged doors are integrated on the Crew Cab models. The models will feature two bed lengths including standard 6.8 foot and 8 foot bed. Available trims are XL, XLT, Lariat and luxury equipped King Ranch and Platinum. Depending on trim level, cab style and additional packages the model can be configured according to your needs. On XL trimmed models rear wheel drive with SRW is standard and four-wheel drive and SRW or DRW combinations are available. However four wheel drive with DRW is not available on XL Super Cab. All cab styles with XL trim can be had with both bed sizes. For extra money remote keyless entry, power locks and mirrors will also be available on XL trim. An 8-inch Ford Sync 3 infotainment system, advanced safety options like rear view camera and blind-spot system can also be had at extra cost. Trailer package which include 360-view camera system, trailer reverse guidance camera and rear view camera is another option on XL trim. Three will also be available Appearance package and for four-wheel drive models FX-4 off road kit. On the XLT models power package is standard and also includes a tailgate lock. Chrome bumpers and grille are also standard on this trim level. Other features that are available on this trim and can be had in different packages are reverse-sensing audible alert, fog lamps, power adjustable pedals, chrome side steps, chrome door handles, chrome exhaust tip, chrome tow hooks, etc. On XLT super cabs and crew cabs will also be options for rain sensing wipers, automatic high-beam headlights, 8-way power driver’s seat, leather wrapped steering wheel, adaptive steering, and also lane departure warning. The Lariat equipment group isn’t available on Regular Cabs. Standard on this trim are fog lamps, running boards, 8-inch infotainment and navigation, digital gauge cluster, leather trim, eight-way power driver seat, Sony sound system, etc. Chrome package and tow package can be added for extra money. On Crew Cab Lariat trimmed models Ultimate package adds voice activated navigation system, remote tailgate, power pedals with memory, push-button start, heated and ventilated seats, memory driver seat, etc. LED lighting package is available at extra cost. The King Ranch trim is only achievable on Crew Cab models. Some of features on this trim are specific leather upholstery, power tilt-and-telescopic steering wheel, power pedals, push-button start, etc. On this trim ultimate package brings power running boards, twin panel sunroof, unique seats, LED head lights and fog lights, cross traffic alert, blind-spot system. Top of the line Platinum trim comes also on Crew Cabs only. It starts from long bed rear wheel drive models with DRW. This trim adds retractable rear step, LED lights, massaging front seats, genuine wood inserts, heated steering wheel. Ultimate package adds here twin-panel sun roof, all-around view camera, trailer camera, lane departure warning, adaptive cruise control, etc. The new 2017 Ford F-350 Super Duty will be available at dealerships late this year. The redesigned model will go on size equivalents like Ram 3500 and Chevy’s Silverado 3500 HD. The price will start from $34,900 for XL trimmed Regular Cab and top of the line Platinum Crew Cab will begin from $62,970.